MAYHEM was spawned to take pre-training supplementation to the forefront of the bodybuilding world. Never before has there been a pre-training supplement of such serious magnitude. Guaranteed you have experimented with other pre-training formulas and you've probably had some success. But MAYHEM is not formulated to give you just "success". MAYHEM is here to shatter all your expectations of what it feels like to be on a truly uncensored pre-training madness formula. Down a super-packed dose and almost immediately you will start to transform your thinking. Thoughts of enraged intensity begin to circulate in your entire being. Weights that previously owned you will be crushed. That dreaded point where your energy repeatedly faded in the past will now be a distant memory, as your body will be electrified on seemingly endless surges of energy. Where other formulas fail you, MAYHEM delivers! Advanced ingredient scavengers seek out lactic acid to help neutralize its lifting limitations unlike anything else so you can lift heavier and train longer. Did you think that the MUTANT Lab Scientists forgot about your number one, be-all-and-end-all goal of getting huge? Not a chance! MAYHEM is injected with proven ingredients to ignite the muscle building process deep at the cellular level for rapid and dramatic gains in freaky muscle and strength! Remember that best workout you ever had in the gym, because when you dose with MAYHEM it will make that session seem like a beginners yoga class. This experimental hybrid formula does it all with an uncompromising hell bent purpose. 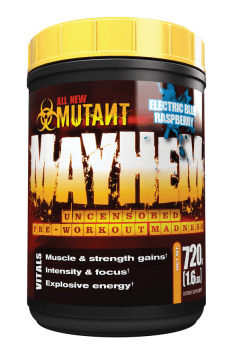 The leading-edge MUTANT Lab Scientists packed so much action oriented, scientifically researched and developed ingredients into MAYHEM that it is virtually impossible to take this supplement and not experience a thunderous wave of effects with every dose. MAYHEM sparks hyper-stimulation for killer intensity and razor sharp focus to annihilate every shred of iron in the gym. Every muscle-mutating ingredient in the bleeding-edge MAYHEM formula works as hard as you do to soak your muscles with more and more anabolic rich blood while you pump out the heavy sets and reps. Bottom line, when you down a phenomenal tasting dose of MAYHEM you will train harder and longer with more energy, you will build freaky amounts of dense muscle, your strength will shoot through the roof and you won't crash hard - ever! 1 serving (1 scoop) 30 minutes before workout. There is no need to take it. Take on an empty stomach. Just eaten meal may weaken the absorption of active ingredients and limit the effects of the product. On first use it's recommended to take the dosage prescribed by the manufacturer. Based on your experience you can modify the size of next doses. Taking the supplement in the evening may cause problems with sleep. Calcium Carbonate, Potassium Citrate, Tricalcium Phosphate, Micronized Bicarbonate, Magnesium Oxide, Calcium Lactate. silicon dioxide, malic acid, natural and artificial flavors (may contain soybean lecithin), sucralose, citric acid, acesulfame K, Brillian Blue FCF (E133), soy lecithin. Cinnulin PF is a patented formula containing an aqueous extract of cinnamon that has an impact on the insulin metabolism (in terms of lowering the level of glucose and its tolerance) and the transport of nutrients (amino acids, glucose, creatine) into the muscle cells. Improves blood lipid profile (balances fractions of cholesterol). It is a component of advanced nutritional supplements - weight loss thermogenic effect, as well as creatine stacks and nitrogen boosters.